Rule of thumb for using xanthan gum is 1/8 teaspoon per 1 cup of flour. Use 2 teaspoons xanthan gum and 1/2 to 3/4 cup of butter. 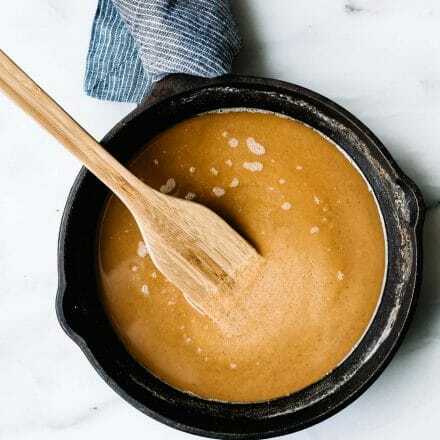 For soups – If you’re using a roux to thicken a soup, it’s best to add at the beginning as it can take some time for the soup/stew to thicken. For sauces, SLOWLY whisk your cold or room temperature liquid (like milk for cream sauce) into the hot roux, then slowly whisk together. Heat the oil or butter in a medium-sized saucepan over medium heat. Whisk the cassava flour into the fat and cook over medium-high heat for 10-12 minutes, stirring every 2-3 minutes. NOTE – Dark roux made with regular flour usually takes up to 45 minutes, but cassava flour creates that nutty dark flavor extra fast since it’s grain free! TIP– You don’t need to wait long for this roux to turn dark. Just 10-15 minutes, max! Whisk the flour into the fat and cook over medium heat for 7-8 minutes, stirring every 2-3 minutes. To make a creamy white sauce (dairy free option) using this light brown roux, see notes. Add ONE teaspoon of xanthan gum, whisk, and then add the other teaspoon of xanthan gum, and whisk. Cook over medium heat, darkening to the desired color. It browns quickly, so always remember to whisk! The roux will continue to thicken as it cools, so don’t worry if your roux seems a little thin at first. Add to then of cooking (soups, chowder, etc) . To make a creamy white sauce using this light brown roux, slowly whisk in 2.5 cups of almond milk. After the milk is incorporated, stir in salt, pepper, and minced garlic. You can also use this roux to make gluten free alfredo sauce recipe with parmesan mixed and melted in! Need a vegan and/or dairy free cream sauce option? Replace the butter with avocado oil (or another high heat oil) then mixing in nutritional yeast (Bob’s Redmill) in place of the parmesan. It tastes super cheesy, yet is much lighter.